If there is a force of nature that disrupts dives and disorients divers as much as any other, it is current. On the flip side, current can be an asset; when used to the diver’s advantage, it makes for an effortless and relaxing diving experience. Current is not an issue when diving quarries and most lakes, but elsewhere, rivers, oceans and large lakes, like the Great Lakes, divers can expect water movement to range anywhere from mild to wild. Unless carefully calculated, monitored and accounted for, current, even in its mildest form, can cause difficulties for unsuspecting divers. It sweeps them away from the boat, causes shore divers to miss the planned exit location and when strong, it physically taxes divers as they labor to swim against it. In most cases, divers are taught to “begin the dive into the current.” This is done for two reasons. First, swimming into the current can be tiring, so divers are told to spend the first part of the dive, when they are fresh, swimming against it. Then they complete the dive by drifting with the current back to the exit location. Theoretically this is a sound concept, however, divers occasionally still miss the boat on the way back or overshoot the exit location. The stronger the current, the greater the chance of slipping up. Second, unless the dive is a planned drift dive, a diver who begins the dive swimming with the current is asking for trouble. Aided by the current, he will cover a lot of seascape in less time than he thinks. When he reverses course to return to the exit location, he will find the going much slower because he now is battling the current. Unless the current is very mild and the diver reverses course well before the halfway point of the dive, it is unlikely that he will make it back to the planned exit location before depleting his air supply or exceeding the planned bottom time. This will require him to ascend sooner than planned, resulting in a long surface swim. In some cases it could result in a rescue situation. When circumstances permit, experienced divers often prefer to drift dive. They go with the flow for the entire dive, intentionally allowing the current to carry them along. Their dive plan is built around entering the water at one location and exiting at another. Drift diving offers many advantages over diving from an anchored boat or entering and exiting at the same location on shore. First, drifting with the water movement is less physically demanding than struggling against current for half the dive. Drift diving generally results in less air being consumed, which could allow many divers to stay down longer. For those who have experienced the ease of drift diving, especially from a boat, it often quickly becomes their favorite style of diving. Drift diving, when done correctly, eliminates any concern about finding the boat at the end of the dive. When the planned bottom time is up or the air supply runs low the diver simply performs a drifting safety stop and surfaces. The boat comes to the diver as opposed to the diver having to find and swim to the boat. Drift diving from shore requires additional planning and is a bit more complicated, but it still eliminates the need to fight the current. Divers enter at an upcurrent location and exit at a predetermined spot farther downcurrent. The drift diving technique can be used anywhere that has consistent water movement, even in areas with slight to moderate current. However, it is used more often in areas that are known for having mild to brisk, or even ripping, currents. On the extreme end of the spectrum, some places offer drift diving that resembles a water park adventure. In areas like Deception Pass on Washington’s Northwest coast, the Current Cut in the Bahamas and the Komodo Islands in Indonesia, drift diving is as much a thrill ride as a diving technique. At these and a handful of other similar spots around the world divers drop into the water purposely overweighted by a few pounds, descend quickly and ride currents of six or more knots. Generally such novelty dives are shorter in bottom time than a normal recreational dive since these types of currents are associated with tidal change in places where the incoming or outgoing tide funnels through a narrow passage. This type of drift diving experience is a thrill one does not soon forget. The majority of drift diving is performed in areas that experience moderate longshore current on a consistent basis. In some cases the direction of a diver’s drift changes depending on the time of day or the tidal flow. Deciding when, where and how to conduct a drift dive is a decision not to be taken lightly. Drift divers should be trained in the technique and be familiar with the area and water conditions of the site they plan to drift. Drift diving can be done from a boat or from shore; although the techniques and planning required for each vary greatly. Drift diving from a boat, especially a dive charter boat, is less involved than drift diving from shore. On a dive charter boat the captain and crew have done most of the work for you in advance. In addition to having already addressed the planning and safety considerations, they are familiar with the area and possess the necessary boating knowledge and skills. Simply follow their directions and employ a few basic diving skills and you’ll have a fun, enjoyable and safe drift diving experience. Boat drift diving is commonly done using one of two techniques: float line drifting or live boating. Float line drift diving involves the use of a surface marker. One of the divers tows a line and float, which often includes a dive flag that trails along on the surface above the dive group. The captain and crew keep track of the divers’ whereabouts by watching and following the marker. Live boat drift diving is conducted in the same fashion as float drifting but without the line and float. The captain and crew keep track of the group by observing their bubbles breaking the surface. The boat stands off a safe distance but near enough that the divers’ bubbles are clearly visible. This works fine in calm water, but is not as reliable in rough seas. The choppier the water the more difficult the bubbles are to see. Using a float line is the easiest and safest method of drift diving. It is the surest way for the boat captain to know the location of the divers. Underwater the line serves as a reference for the group and during the safety stop it is helpful in maintaining a consistent depth. On the surface the float provides a staging area for divers waiting to exit the water. On the downside, float diving is more restrictive than live boating since one of the divers in the group has to be responsible for tending the line and towing the float. On a guided dive this is usually the guide’s job, but not always. If you happen to be the diver responsible for the float, as the group descends you must pay out the line. During the dive you must adjust the line scope (the length of line from you to the float) to account for significant changes in depth and to keep it from becoming snagged. Upon ascent the line must be retracted to prevent anyone from becoming tangled in the excess. Some float line divers carry the excess line coiled in their hand; however, most use a reel. For safety’s sake, when towing a float the coil of line or reel should be held in the diver’s hand and never secured to his equipment or body. As unlikely as it might sound, if a passing boat were to run over the float and snag the line a diver with the reel secured to his buoyancy compensator (BC) or the line wrapped around his arm could be dragged to the surface, resulting in a decompression injury. When drift diving, whether the technique used is float line or live boating, it is important that all divers stay together as a group. This requires that everyone be geared up and ready to enter the water before the first diver enters; the others follow close behind. If using a float, divers can remain on the surface near the float until everyone is in, and then descend together. When live boating, depending on the type and velocity of the current, it often is important that divers enter in rapid succession, descend immediately and regroup at the bottom. When diving from a charter boat the technique to be followed will be included in the predive briefing. Once at depth the group must not stray too far from the diver towing the float or the designated leader, if live boating. This is important because the boat captain and crew are concentrating on following the float or the group’s bubbles. Generally, as individual members of the group run low on air they notify the guide that they are ascending, proceed to safety-stop depth, complete the stop while drifting above the group, and then surface. They will quickly be spotted since this technique places them either adjacent to the float or near where the group’s bubbles are breaking the surface. If they surface elsewhere they run the chance of not being seen and may end up waiting at the surface until the remainder of the group has reboarded the boat. Depending on the charter operation, water conditions and the destination, when participating in a guided drift dive the entire group may be required to surface when the first diver begins to run low on air. Generally, however, individual divers or buddy teams who run low on air before reaching the planned maximum bottom time are permitted to proceed to safety-stop depth and complete the dive as described above. The technique used for reboarding the boat varies from vessel to vessel and will be addressed during the predive briefing. When drift diving from a boat, exiting the water always involves the boat coming to the diver rather than the diver having to surface, find and swim to the boat. When diving from a large vessel, entering and exiting the water often is done from a smaller tender boat that is used to shuttle divers to and from the drift dive location. Reboarding the boat is the most critical part of drift diving. First, keep in mind that both the boat and any divers on the surface waiting to reboard are drifting with the current, but not necessarily at the same speed. 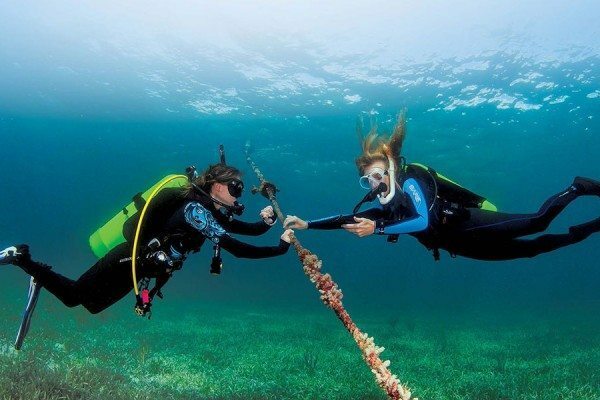 If the boat is drifting faster than the divers, divers positioned on the downcurrent side of the boat face the risk of being overrun by the vessel. Second, most dive boats are driven by one or more propellers, which are underwater at the stern of the vessel. When engaged, these propellers turn at a dangerously high speed. Divers waiting to reboard are near the propeller, creating a potentially dangerous situation. Whenever in the water near the stern of a boat, especially when the engine is running, be aware of your position in relation to the propeller. If the engine suddenly starts or an idling boat’s propeller begins turning, immediately move away from the boat. When drift diving it is important that each diver closely follow the instructions of the crew, exit quickly and efficiently, and immediately clear the exit area so other divers can reboard. It is recommended that any boat involved in drift diving leave two people on board; one to operate the boat and the other to act as a spotter, helping follow the divers’ movement and controlling the entry and exit processes. The easiest and safest way to experience drift diving, especially for the first time, is on a guided dive from a dive charter boat; the planning and safety considerations have been addressed by the charter crew. All the diver has to do is enter the water when instructed, stay with the group, keep the guide informed of remaining air supply and surface when directed to do so. In between, the diver simply floats along at depth, enjoying the sights. Drift diving from shore, whether it is in the ocean, a lake or a river, requires more thorough planning and execution than drift diving from a boat. From a boat the divers are not concerned with where they end up; the boat will come to them. However, when drift diving from shore the entry and exit locations must be strategically chosen so the divers are able to complete the drift before exhausting their air supplies or exceeding the no-decompression limits. Making these decisions requires knowledge of shoreline access, appropriate entry and exit alternatives and water movement. If you plan to dive from point “A” to point “B” based on a three-knot current and the actual current velocity is less than three, you will come up short of your planned exit location. The result could be a long surface swim or lugging your equipment farther than desired, possibly over unfamiliar terrain. Always select at least one, and preferably two, alternate downstream exit locations when drift diving from shore. It is not uncommon for changes in current velocity, unfamiliarity with the substrate or inattention to time and distance traveled to cause divers to overshoot the planned exit location. Be prepared to exit farther downcurrent if the water flow is stronger than anticipated or you simply miss the primary exit location. It is recommended that the float and flag technique be used when drift diving from shore. Even if the water cannot be navigated by boats, towing a float and flag serves as a reference for the divers at depth and apprises people on shore of their location. When drift diving from shore, always leave a written copy of your dive plan with a responsible person on shore. Include in it the proposed entry and primary exit location, alternate exit locations and estimated time of arrival at the primary location. After all divers have entered the water and are on their way, the shore person should move to the primary exit location and wait for the divers to arrive. The safest way to drift dive from shore is with a dive professional who has experience at diving the area. Until you have dived the location a few times, leave the planning and guiding to someone who is appropriately trained and experienced. Proficiency at all basic scuba skills is important to safely and successfully drift dive. In addition, a keen awareness of your surroundings and an understanding of water movement and its effect on floating objects will go a long way toward keeping you out of trouble. Drift diving often is done along walls that plunge to hundreds, even thousands, of feet beyond the recommended recreational scuba depth limit, so astute buoyancy control is mandatory to avoid going too deep. This valuable skill also comes in handy in locations where upwelling and downwelling currents are encountered and near the surface during drifting safety stops. Being comfortable in the water and having good air consumption are also attributes that will add to your drift diving pleasure. Don’t be too concerned if you tend to use more air than other divers because drift diving requires significantly less physical exertion. You’ll notice a reduced consumption rate and may even find that you begin running out of bottom time before you run low on air. Once back on the surface, physical conditioning comes into play as divers sometimes struggle with the current to reboard the boat or are required to swim to the exit location when shore drifting. Make sure your physical stamina and kicking muscles are in top shape when planning a drift diving outing. To be seen easily at sea, equip yourself with an array of surface signaling devices. For best results at gaining the boat crew’s attention in any situation, carry an inflatable signaling device, an audible device, a signaling mirror and a dive light for when visibility diminishes. With these four devices you’re nearly guaranteed to be seen while floating on the surface in any water conditions. To approach drift diving with the utmost confidence, consider enrolling in a Drift Diver specialty course before taking to the currents. And, of course, an advanced certification and deep diving specialty will boost your skills and confidence anywhere, but especially on those drift dives along deep walls. Whether it is a ripping current thrill ride down a river, or a leisurely float along a wall or tropical reef, once you’ve experienced drift diving you may never again want to swim against the current. Under the right circumstances current can be used to a diver’s advantage. Just make the plunge and let nature take its course. Carefully follow all predive instructions. File a dive plan with shore support person if shore drifting. Keep excess float line coiled on reel. Do not stray too far from the guide or designated leader. Do not exceed the planned maximum depth. Do not make contact with the float line unless you’re the carrier. Drift a safe distance from the bottom, reef or wall. Avoid being forced by the current into marine organisms. Do not resist the current by grabbing onto substrate. Notify the guide or leader when you need to surface. Perform safety stops while drifting above the group. Surface near float or group’s bubbles. Closely follow boat crew’s exit instructions. Avoid the downcurrent side of the boat. When instructed, exit the water quickly and efficiently. Immediately clear exit area upon reboarding the boat. Deploy surface signaling devices as needed. Some live-aboard dive boats and land-based dive destinations use the drift diving technique exclusively. Check before making reservations and complete a drift diving specialty course before you go.